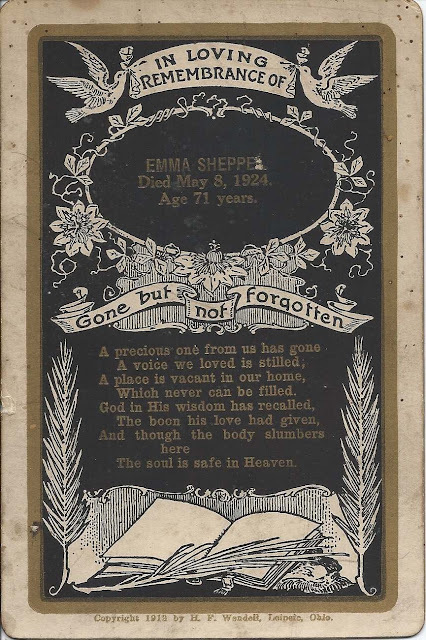 Memorial card on the occasion of the death of Emma Sheppe on May 8, 1924. There's a blemish after her surname, so it's possible there's an extra letter to Sheppe. 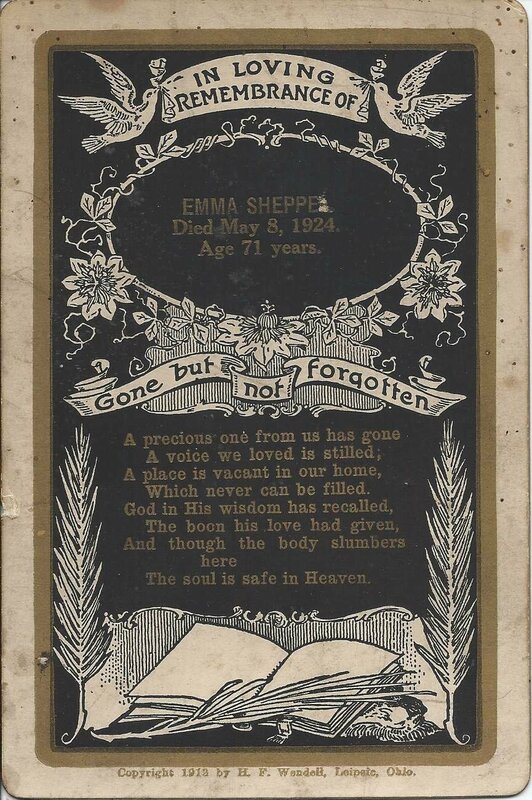 "Emma Sheppe, Died May 8, 1924, Age 71 years" - implying she was born about 1853. 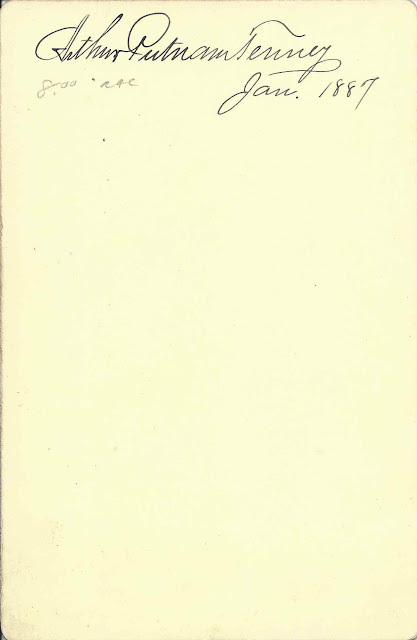 Text at bottom indicates the card was printed by H. F. Wandell in Leipsic, Ohio; there's nothing on the reverse. There was an Emma (Crosby) Sheppe who was born about 1853 in Vermont, daughter of William E. and Electa Adelaide (Patch) Crosby, and who was still alive in 1920. This Emma was married to Paul H. Sheppe and was living at Kinderhook, New York. They had a daughter Jennie, born about 1873. If you have corrections and/or additions to the information above, or if you feel that the memorial card represents another Emma Sheppe, please leave a comment or contact me directly. Memorial card published on the occasion of the death of Mrs. W. C. Longley on 22 April 1899. "Died Apr. 22, 1899, Aged 22 Years". No studio imprint; nothing on reverse. There was an Eva C. (Carroll) Longley, daughter of John E. and Phoebe E. (Dunn) Carroll who died on that date at Milford, Maine. Maine Marriage Records show her husband as Willis Leroy Longley, rather than Willis C. Longley, but perhaps the card is in error. Or Mrs. W. C. Longley was someone else. 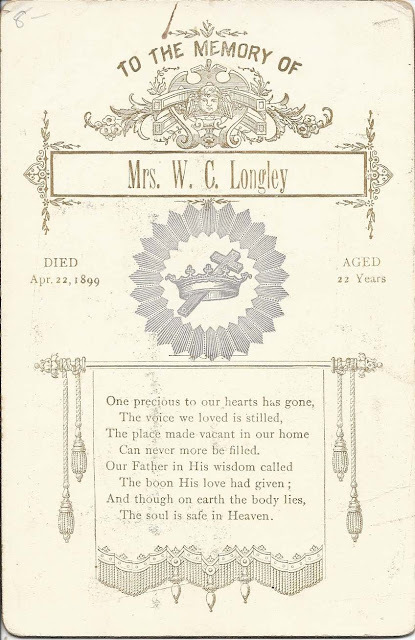 If you know of a Mrs. W. C. Longley who died on April 22, 1899, please leave a comment or contact me directly. Thanks! 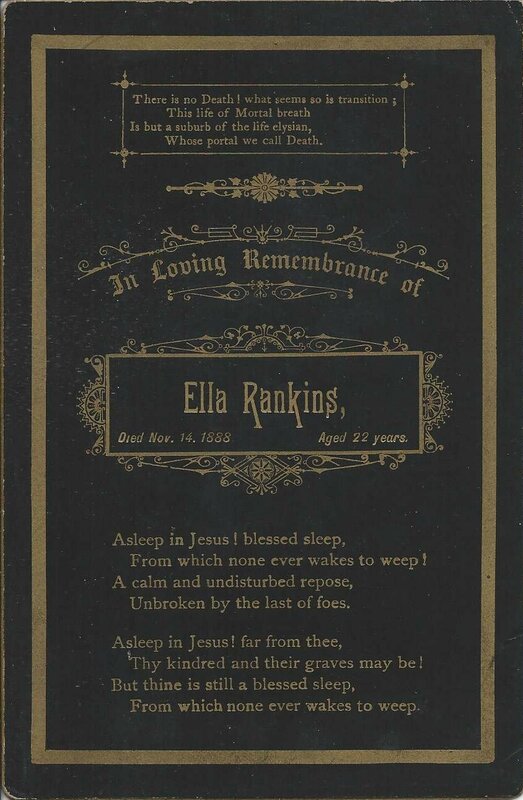 Memorial card published upon the occasion of the death of Ella Rankins. No maker's imprint; nothing on reverse. 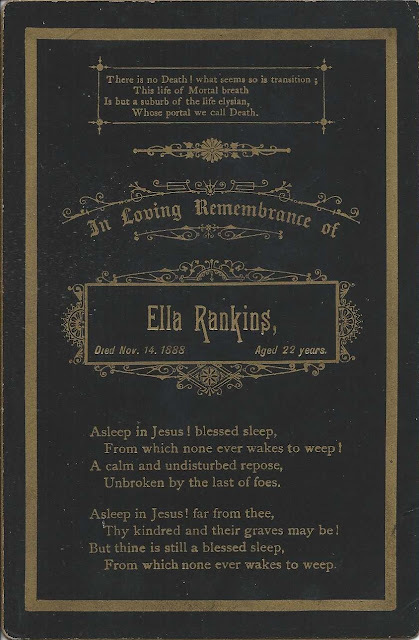 "Ella Rankins, Died Nov. 14, 1888, Aged 22 years." I don't know if Rankins was Ella's birth name or married name. If you can tease out her identity from her date of death and approximate date of birth, please leave a comment or contact me directly. 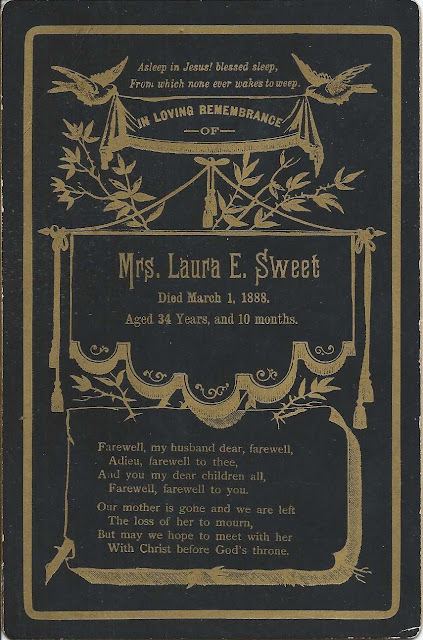 Memorial card published on the occasion of the death of Mrs. Laura E. Sweet on 1 March 1888. Nothing on reverse. "Mrs. Laura E. Sweet, Died March 1, 1888. Aged 34 Years, and 10 months". Laura E. (Clarry/Clary) Sweet was born Laura Ellen Clarry on 28 April 1853, at Holden, Maine, the daughter of Edward Carpenter Clarry and Caroline H. (Perry ?) Clarry. On 25 December 1876 at Eddington, Maine, Laura Ellen Clarry married Bromley C. Sweet, son of Campbell and Margaret Caroline (Comins) Sweet. Bromley was born 29 January 1834. Bromley and Laura had four children together, I believe. After Laura's death in 1888, Bromley married Elzena R. Moore and had more children. He died in 1912. 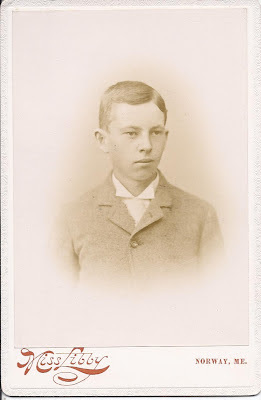 Cabinet photograph of a young man identified as Henry T. Stiff, Class of 1891 at B.H.S., which might refer to Brockton High School at Brockton, Massachusetts. The photograph was taken by the Munroe and Stiff studio of 64 Warren Street, Boston, Roxbury District. 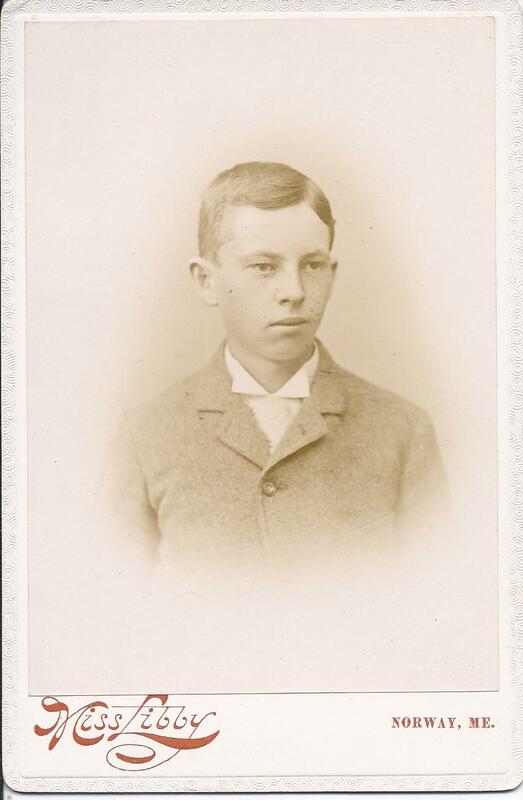 Henry's father Thomas P. Stiff was a photographer; it must have pleased him to take his son's graduation photograph. Henry Thomas Stiff was born 9 January 1873 at Carleton, Ontario, the son of Thomas P. and Charlotte Amelia (Keith) Stiff, who were born at Osterville, Massachusetts, and Middleborough, Massachusetts, respectively. Thomas operated a photography studio at Ottawa, Ontario, with his brother Philander, for a few years in the 1860s and 1870s. He's listed in the 1871 Census of Canada at Ottawa. Henry's younger brother Walter was born in Canada about 1876/77. The family returned to Massachusetts not long after that. 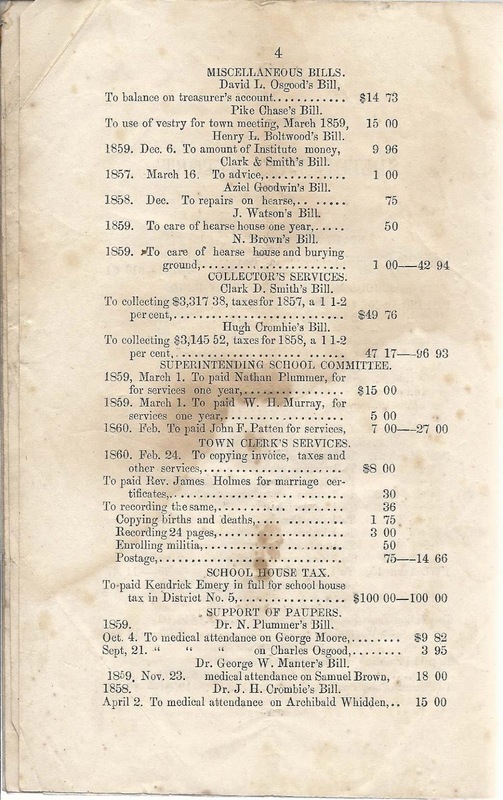 They were enumerated in the 1880 Census of Taunton, Massachusetts. On 14 April 1897, Henry Thomas Stiff married Bessie Cary Packard, daughter of James Willard Packard and Mary Alice (Cary) Packard. Bessie was born about June 1873 and died about seven years after her marriage, on 1 February 1904 at Brockton. I don't believe they had any children. On 5 November 1905 at Brockton, Massachusetts, Henry married Bessie's younger sister Alice Marie Packard, who was born about March 1883. They raised a family of at least three children at Boston, Massachusetts, where Henry was a civil engineer. By the time of the 1920 Census, Alice Marie (Packard) Stiff had died and left Henry a widower again. If you have any corrections to the information above or any insights into the Stiff and Packard families, please leave a comment or contact me directly. Cabinet photograph of a man identified on reverse as Arthur Putnam Tenney; the photograph was taken by the Vickery studio of Haverill, Massachusetts. 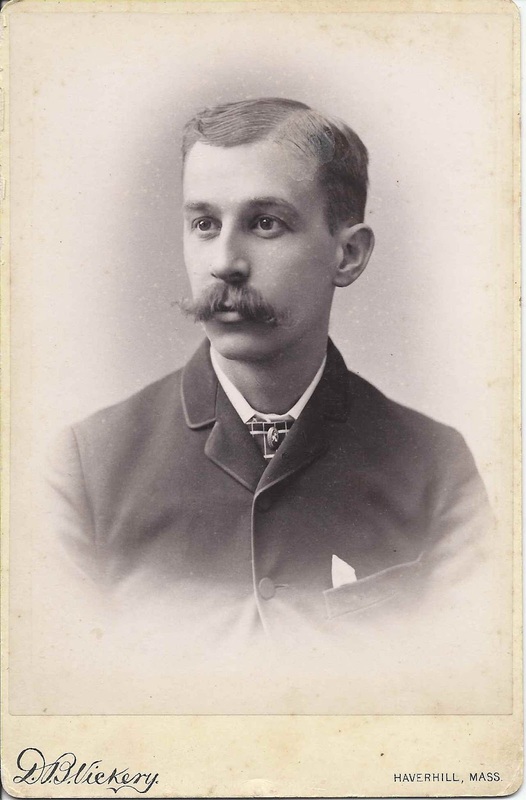 Arthur Putnam Tenney was born 11 January 1859 at Haverhill, Massachusetts, the son of David Barnard Tenney and wife Caroline (Stocker) Tenney, who were born at Georgetown, Massachusetts, and Bath, Maine, respectively. His paternal grandparents were David B. and Hannah T. (Little) Tenney. His maternal grandparents were Timothy N. and Susan (White) Stocker. On 17 October, 1894 at Westbrook, Maine, Arthur married Helen Mary Foster, daughter of Thomas Jefferson Foster and wife Mary Rolfe (Divine) Foster. Helen was born 26 September 1862 at Lewiston, Maine. Her paternal grandparents were Solomon Berry Foster and wife Eunice (Ricker) Foster. Her maternal grandparents were John and Sarah Jane (Noyes) Divine. Arthur and Helen settled at Haverhill, Massachusetts where Arthur worked at a bank. I couldn't find any children for them. If you have any corrections to the information above or if you have insights into Arthur Putnam Foster, his wife Helen Mary Foster, and their families, please leave a comment or contact me directly. 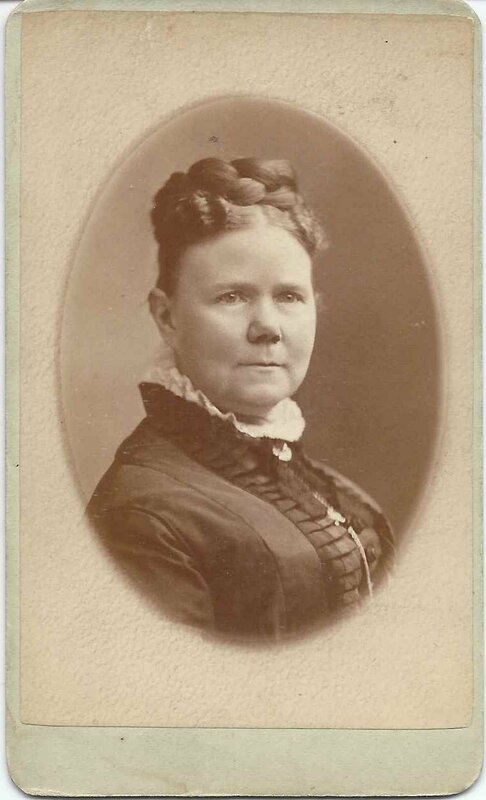 Carte de Visite of a woman identified on reverse as Harriet Sherburne Withington. The ID also includes her date of death: 8 March 1898. 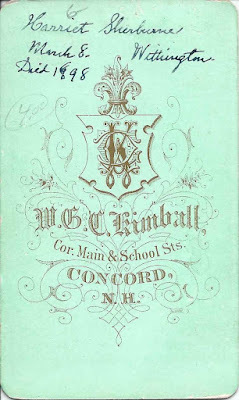 The photograph was taken by the Kimball studio of Concord, New Hampshire. Harriet Sherburne Clapp was born 10 July 1818 at Dorchester, Massachusetts, the daughter of Joseph and Betsey (Tileston) Clapp. Some records have her maiden name as Clap. Harriet became the second wife of Moses Withington on September 1, 1853. Moses Withington was born December 1, 1810 at Brookline, Massachusetts, son of Enos and Patience (Leeds) Withington. His first wife, with whom he had at least three children, was Jane Clap, daughter of John and Priscilla (Holden) Clap. Harriet and Moses had a daughter, Anna Sherburne Withington, born January 24, 1856 at Brookline, Massachusetts. I'd like to know how it came about that Harriet was at Concord, New Hampshire, to have her photograph taken. If you have any corrections to the information above, or if you have insights about Harriet Sherburne Clapp and her family, please leave a comment or contact me directly. 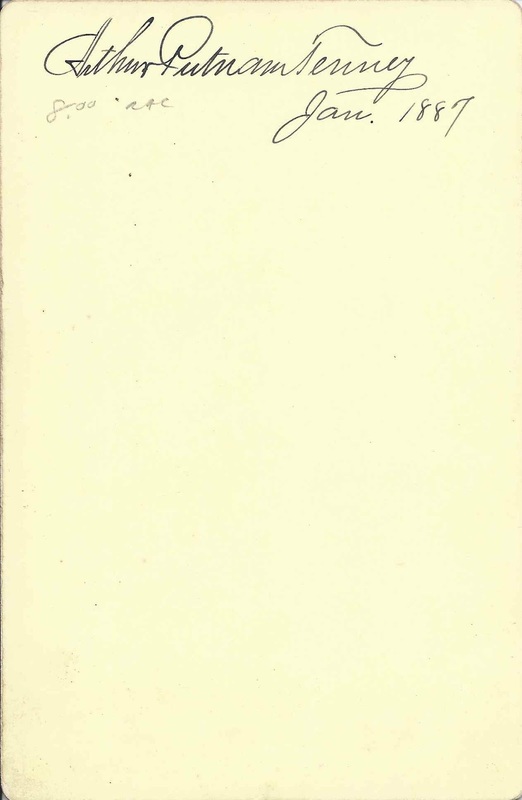 The title page, above, has the same text as the cover. 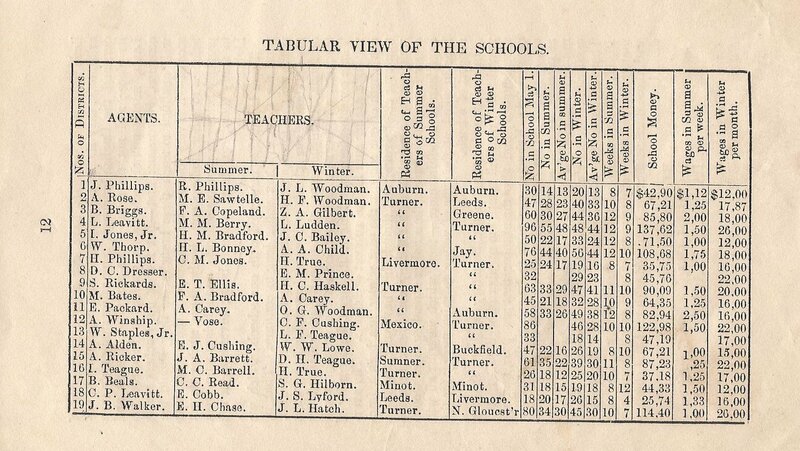 Note: A table at the end gives the residences of the teachers named below. The summer school was taught by Miss Roxy Phillips, with good success as a beginner. The winter school was taught by Mr. J. L. Woodman. This school was small and short, being only seven weeks. The scholars made some advancement; but not rapid. It was the teacher's first school; and we thought a little more nearness of thought and feeling, toward his scholars, would improve his school. The summer school was taught by Miss Maria E. Sawtelle, for the second time, which speaks well for her in the estimation of the parents. One great difficulty in this school has been, in times past, that the scholars read and answered their questions in so low a tone of voice, that they were with difficulty understood. This was very much improved in this school. Improvement in other things was quite good. The winter school was commenced by Mr. Kyes, who was obliged to suspend his labors at the commencement of the second week, on account of ill health. This school was visited once; and then there was a great lack of discipline. 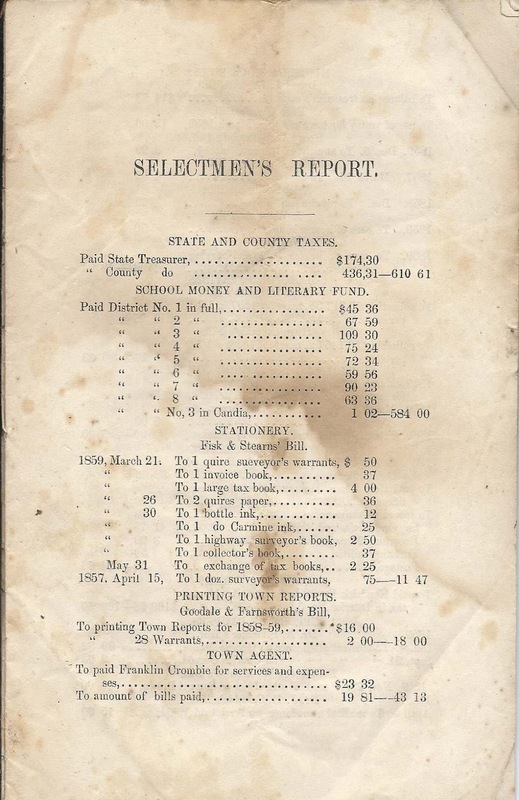 This school was afterwards taught by Mr. Henry F. Woodman, under whose tuition it was well disciplined; and the advancement in some of the classes good; particularly in reading. 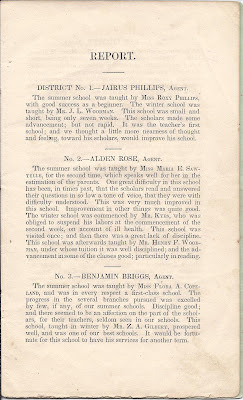 The summer school was taught by Miss Flora A. Copeland, and was in every respect a first-class school. The progress in the several branches pursued was excelled by few, if any, of our summer schools. Discipline good; and there seemed to be an affection on the part of the scholars, for their teachers, seldom seen in our schools. This school, taught in winter by Mr. Z. 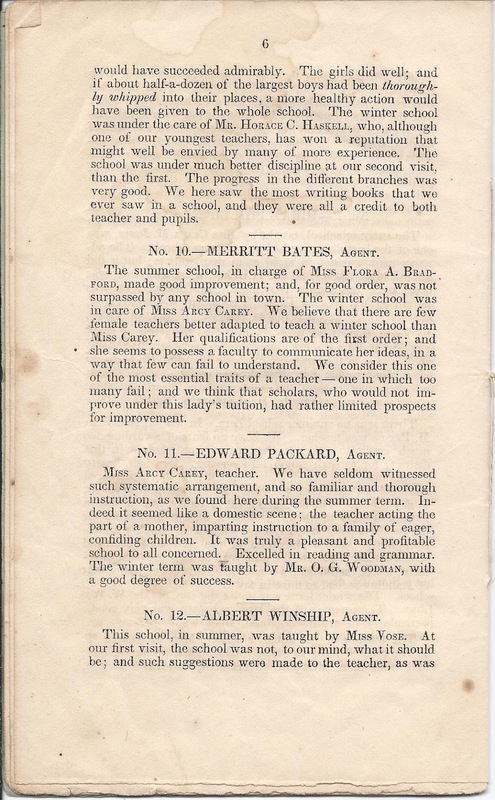 A. Gilbert, prospered well, and was one of our best schools. It would be fortunate for this school to have his services for another term. The summer school was in care of Mrs. Mercy M. Berry. Judging from her former success, we expected that the school would be profitable, and in this we were not disappointed. We believe that this lady's faculties have not become greatly impaired, (as some might suppose,) by the change she has recently undergone. 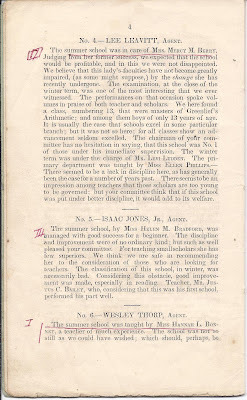 The examination, at the close of the winter term, was one of the most interesting that we ever witnessed. The performances on that occasion spoke volumes in praise of both teacher and scholars. We here found a class, numbering 13, that were masters of Greenlief's Arithmetic; and among them boys of only 13 years of age. It is usually the case that schools excel in some particular branch; but it was not so here; for all classes show an advancement seldom excelled. The chairman of your committee has no hesitation in saying that this school was No. 1 of those under his immediate supervision. 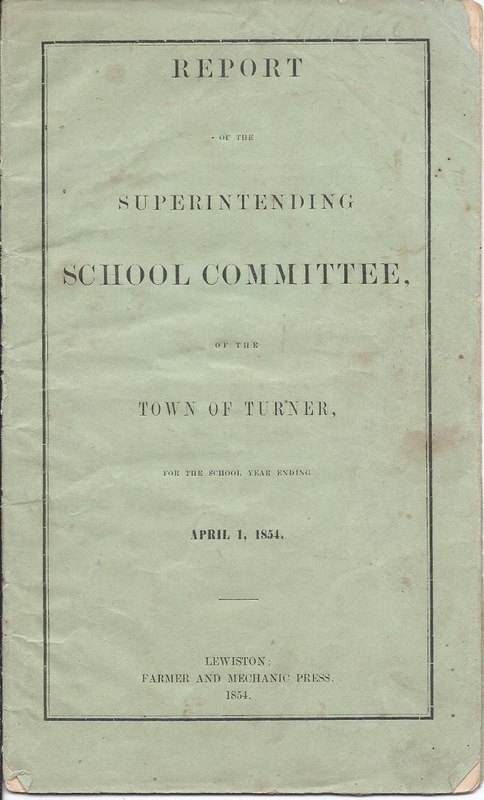 The winter term was under the charge of Mr. Levi Ludden. 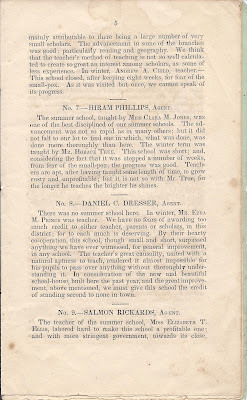 The primary department was taught by Miss Ellen Phillips. - There seemed to be a lack of discipline here, as has generally been the case for a number of years past. There seems to be an impression among teachers that these scholars are too young to be governed; but your committee think that if this school was put under better discipline, it would add to its welfare. The summer school, by Miss Helen M. Bradford, was managed with good success for a beginner. The discipline and improvement were of no ordinary kind; but such as well pleased your committee. For teaching small scholars she has few superiors. We think we are safe in recommending her to the consideration of those who are looking for teachers. The classification of this school, in winter, was necessarily bad. Considering this obstacle, good improvement was made, especially in reading. 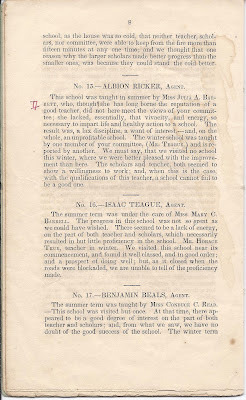 Teacher, Mr. Justus C. Bailey, who, considering that this was his first school, performed his part well. mainly attributable to there being a large number of very small scholars. The advancement in some of the branches was good; particularly reading and geography. We think that the teacher's method of teaching is not so well calculated to create so great an interest among scholars, as some of less experience. In winter, Andrew A. Child, teacher - This school closed, after keeping eight weeks, for fear of the small-pox. As it was visited by once, we cannot speak of its progress. 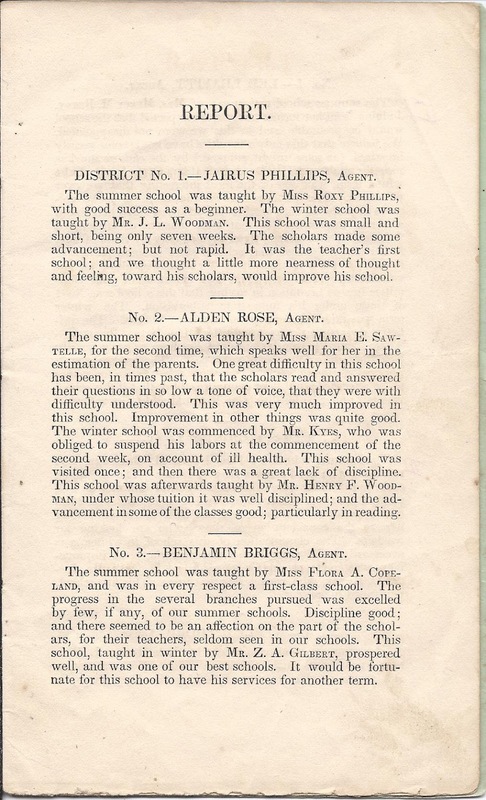 The summer school, taught by Miss Clara M. Jones, was one of the best disciplined of our summer schools. The advancement was not so rapid as in many others; but it did not fall to our lot to find one in which, what was done, was done more thoroughly than here. 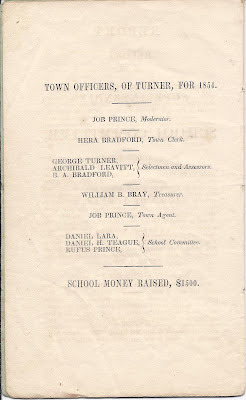 The winter term was taught by Mr. Horace True. This school was short; and, considering the fact that it was stopped a number of weeks, from fear of the small-pox, the progress was good. Teachers are more apt, after having taught some length of time, to grow rusty and unprofitable; but it is not so with Mr. True, for the longer he teachers the brighter he shines. There was no summer school here. 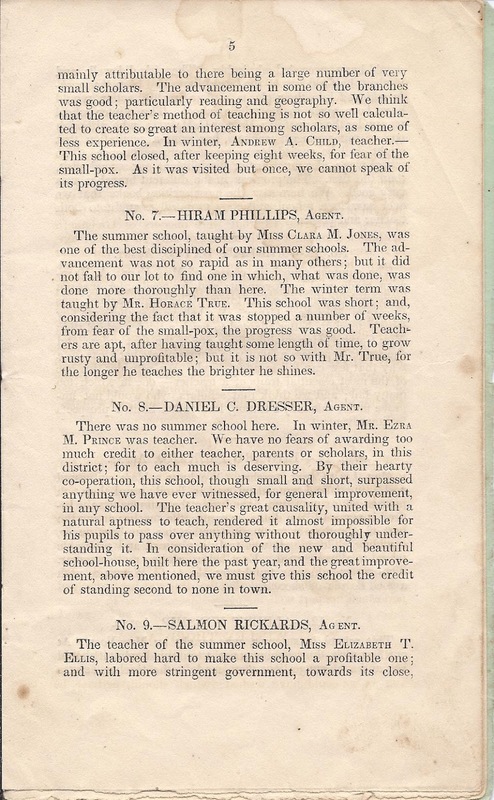 In winter, Mr. Ezra M. Prince was teacher. We have no fears of awarding too much credit to either teacher, parents or scholars, in this district; for to each much is deserving. By their hearty co-operation, this school, though small and short, surpassed anything we have ever witnessed, for general improvement, in any school. The teacher's great causality, united with a natural aptness to each, rendered it almost impossible for his pupils to pass over anything without thoroughly understanding it. In consideration of the new and beautiful school-house, built here the past year, and the great improvement, above mentioned, we must give this school the credit of standing second to none in town. would have succeeded admirably. 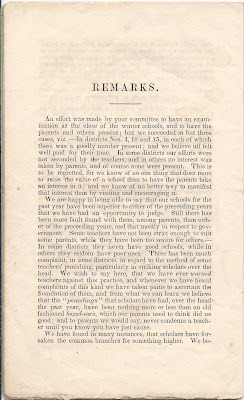 The girls did well; and if about half-a-dozen of the largest boys had been thoroughly whipped into their places, a more healthy actions would have been given to the whole school. 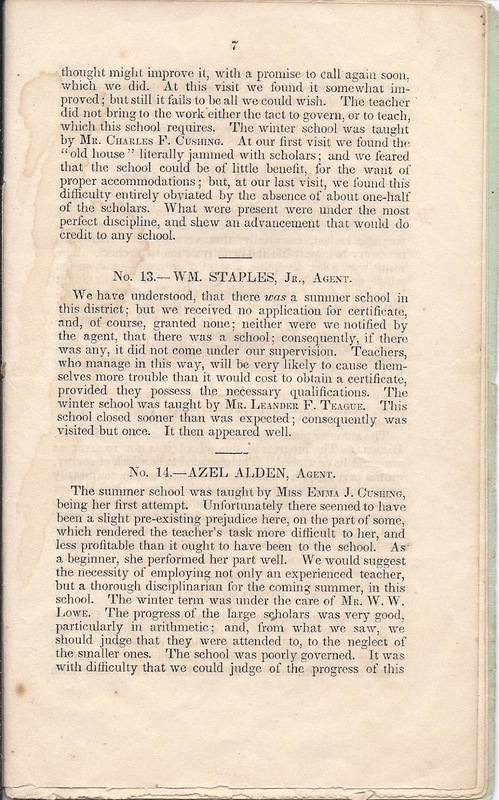 The winter school was under the care of Mr. Horace C. Haskell, who, although one of our youngest teachers, has won a reputation that might well be envied by many of more experience. The school was under much better discipline at our second visit, than the first. The progress in the different branches was very good. 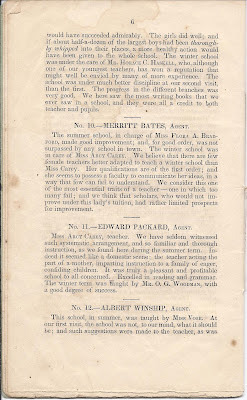 We here saw the most writing books that we ever saw in a school, and they were all a credit to both teacher and pupils. The summer school, in charge of Miss Flora A. Bradford, made good improvement; and for good order, was not surpassed by any school in town. The winter school was in care of Miss Arcy Carey. We believe that there are few female teachers better adapted to teach a winter school than Miss Carey. Her qualification are of the first order; and she seems to possess a faculty to communicate her ideas, in a way that few can fail to understand. We consider this one of the most essential traits of a teacher - one in which too many fail; and we think that scholars who would not improve under this lady's tuition, had rather limited prospects for improvement. Miss Arcy Carey, teacher. We have seldom witnessed such systemic arrangement, and so familiar and thorough instruction, as we found here during the summer term. Indeed it seemed like a domestic scene; the teacher acting the part of a mother, imparting instruction to a family of eager, confiding children. It was truly a pleasant and profitable school to all concerned. Excelled in reading and grammar. The winter term was taught by Mr. O. G. Woodman, with a good degree of success. thought might improve it, with a promise to call again soon, which we did. At this visit we found it somewhat improved; but still it fails to be all we could wish. The teacher did not bring to the work either the tact to govern, or to teach, which this school requires. The winter school was taught by Mr. Charles F. Cushing. At our first visit we found the "old house" literally jammed with scholars; and we feared that the school could be of little benefit, for the want of proper accommodations; but, at our last visit, we found this difficulty entirely obviated by the absence of about one-half of the scholars. What were present were under the most perfect discipline, and show an advancement that would do credit to any school. 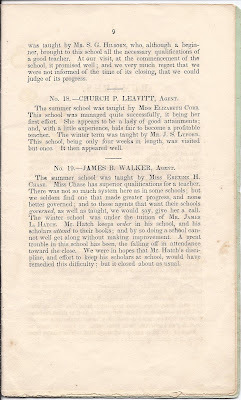 We have understood, that there was a summer school in this district; but we received no application for certificate, and, of course, granted none; neither were we notified by the agent, that there was a school; consequently, if there was any, it did not come under our supervision. Teachers, who manage in this way, will be very likely to cause themselves more trouble than it would cost to obtain a certificate, provided they possess the necessary qualifications. 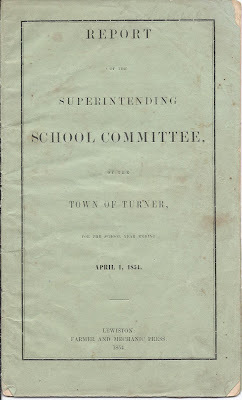 The winter school was taught by Mr. Leander F. Teague. This school closed sooner than was expected; consequently was visited but once. It then appeared well. school, as the house was so cold, that neither teacher, scholars, nor committee, were able to keep from the fire more than fifteen minutes at any one time; and we thought that one reason why the larger scholars made better progress than the smaller ones, was because they could stand the cold better. 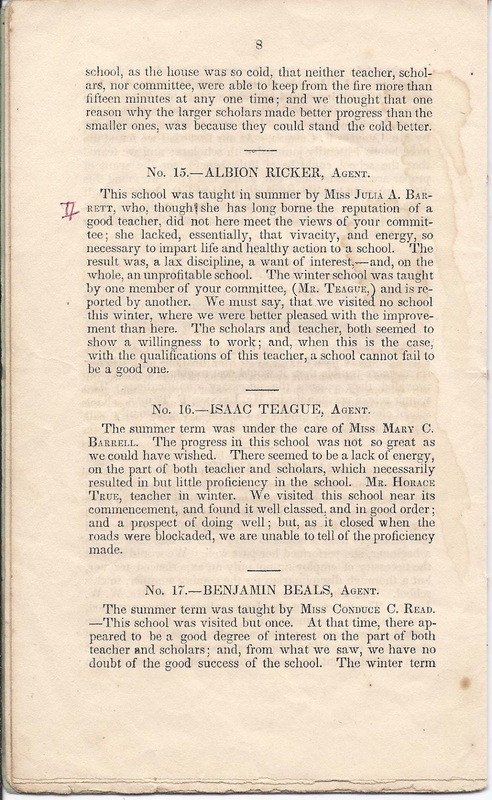 This school was taught in summer by Miss Julia A. Barrett, who, though she has long borne the reputation of a good teacher, did not here meet the views of your committee; she lacked, essentially, that vivacity, and energy, so necessary to impart life and healthy action to a school. The result was, a lax discipline, a want of interest, - and, on the whole, an unprofitable school. 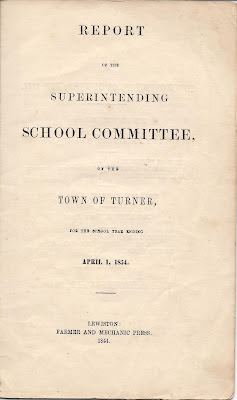 The winter school was taught by one member of our committee, (Mr. Teague) and is reported by another. We must say, that we visited no school this winter, where we were better pleased with the improvement than here. The scholars and teacher, both seemed to show a willingness to work; and, when this is the case, with the qualifications of this teacher, a school cannot fail to be a good one. 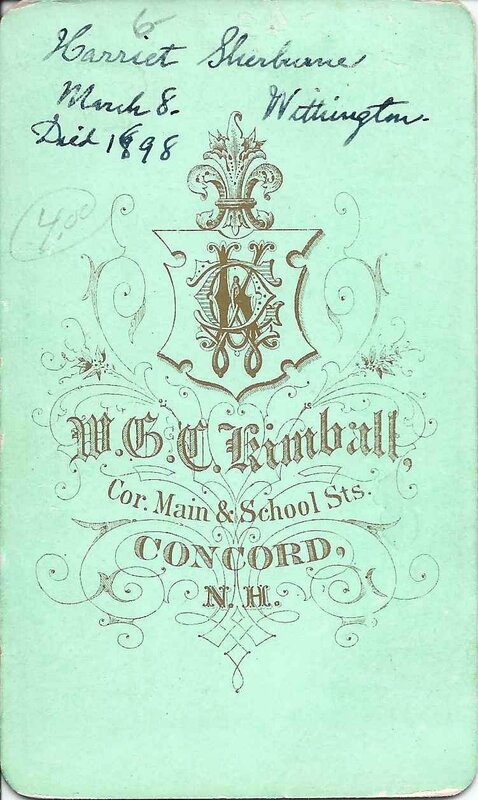 The summer term was under the care of Miss Mary C. Barrell. The progress in this school was not so great as we could have wished. There seemed to be a lack of energy, on the part of both teacher and scholars, which necessarily resulted in but little proficiency in the school. Mr. Horace True, teacher in winter. We visited this school near its commencement, and found it well-classed, and in good order; and a prospect of doing well; but, as it closed when the roads were blockaded, we are unable to tell of the proficiency made. was taught by Mr. S. G. Hilborn, who, although a beginner, brought to this school all the necessary qualifications of a good teacher. 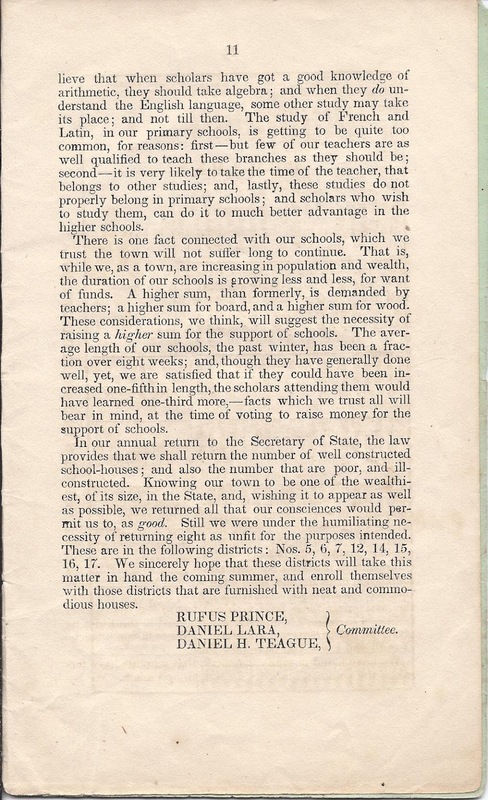 At our visit, at the commencement of the school, it promised well; and we very much regret that we were not informed of the time of its closing, that we could judge of its progress. The summer school was taught by Miss Elizabeth Cobb. This school was managed quite successfully, it being her first effort. She appears to be a lady of good attainments; and, with a little experience, bids fair to become a profitable teacher. 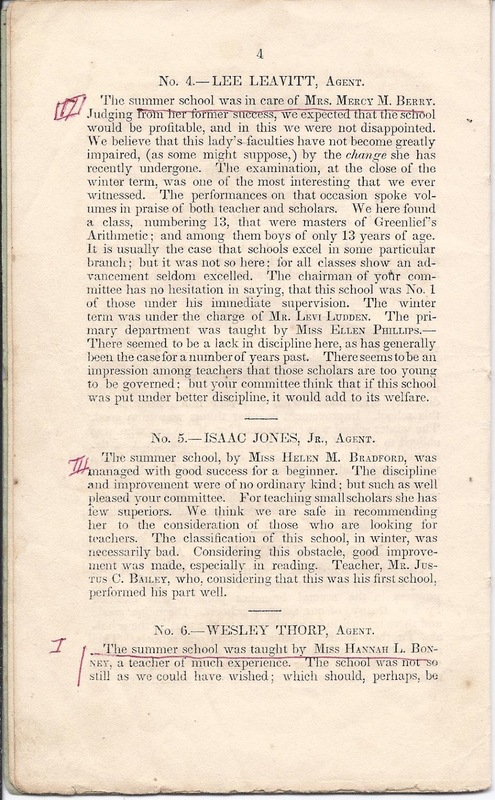 The winter term was taught by Mr. J. S. Lyford. 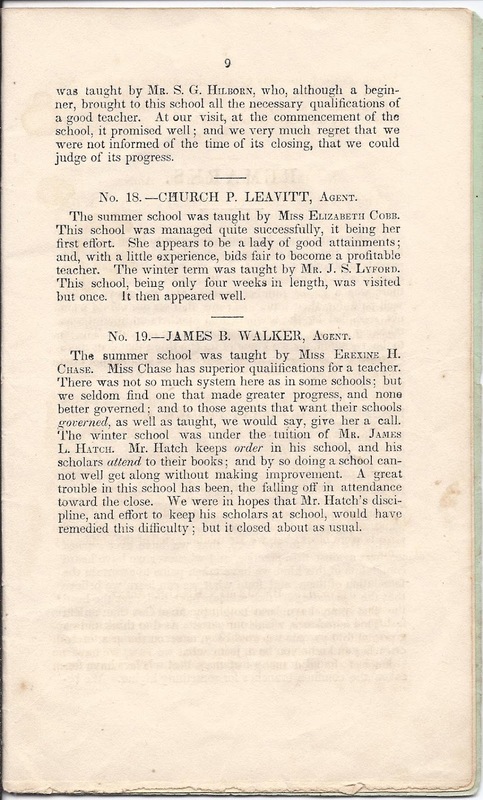 This school, being only four weeks in length, was visited but once. It then appeared well. The summer school was taught by Miss Erexine H. Chase. Miss Chase has superior qualifications for a teacher. 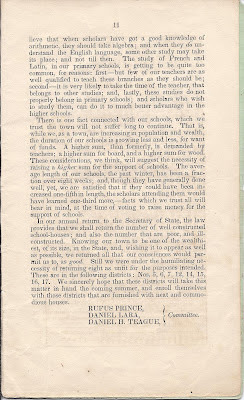 There was not so much system here as in some schools; but we seldom find one that made greater progress, and none better governed; and to those agents that want their schools governed, as well as taught, we would say, give her a call. 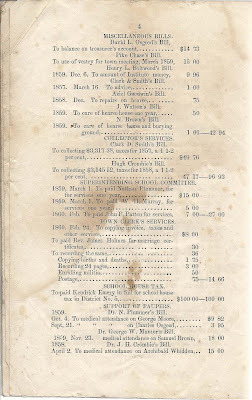 The winter school was under the tuition of Mr. James L. Hatch. 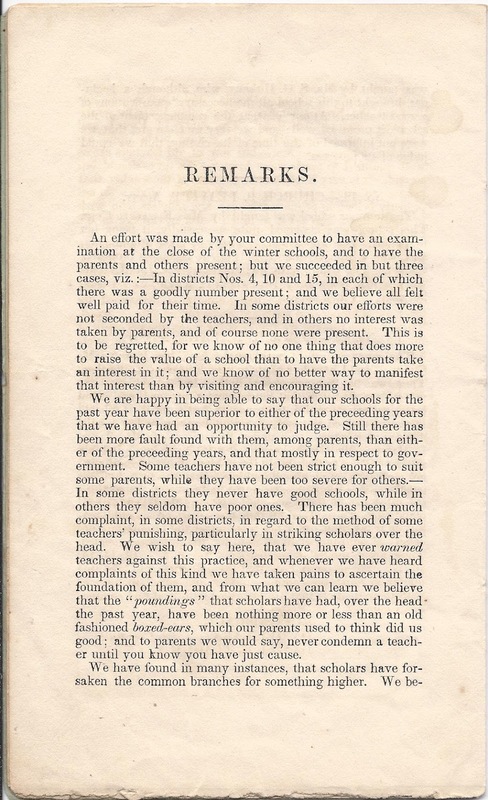 Mr. Hatch keeps order in his school, and his scholars attend to their books; and by so doing a school cannot well get along without making improvement. A great trouble in this school has been, the falling off in attendance toward the close. We were in hopes that Mr. Hatch's discipline and effort to keep his scholars in school, would have remedied this difficulty; but it closed about as usual. 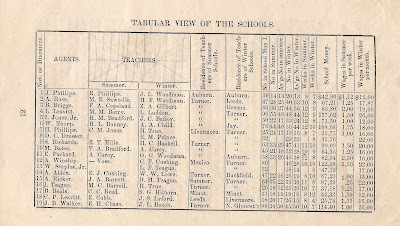 The table above contains the names of the agents and teachers, as well as the teachers' residences, their pay and the number of their students. If you have any insights into any of the people mentioned above, please leave a comment or contact me directly. Two cabinet photographs of an unidentified young man, one taken by the Bartlett studio on Cottage Street in Norway, Maine, and the other by Miss Libby of Norway, Maine. The photograph above shows what I think to be either the older brother of the boy in the photograph below, or the same person at a different stage of life. If you recognize the person in these photographs from your family albums or research, please leave a comment or contact me directly. Photographs of Frederick K. Bradstreet and his daughter Gertie Blanch Bradstreet. An earlier post featured a photograph of Fred's son Seth Bradstreet. Frederick K. Bradstreet was born about July 1846 at Freedom, Maine, the son of Simon and Eunice (Fuller) Bradstreet. His paternal grandparents were John and Lucinda (Broad) Bradstreet. His maternal grandparents were Abraham and Susan (Silvester) Fuller. On 1 February 1874, Fred married Lizzie M. Harvey, daughter of Asa and Marjorie (Bradstreet) Harvey. I don't know if they had children. Lizzie was born 1 February 1852 at Freedom, Maine, and died there on 14 May 1880. Fred subsequently married Clara A. Harvey, Lizzie's younger sister, who was born about 1861 in Freedom. Some official sources have her name as Clara, and some as Clora. I believe Fred and Clara/Clora had five children. Seth Bradstreet, mentioned above, was the second born, and Gertie was the third born, on 21 December 1886, at Freedom, Maine. Gertie's birth record gives her name as Gertie Blanch Bradstreet, though some later records show her name as Gertrude. I don't believe Gertie married, as her death record shows her name as Gertrude B. Bradstreet. 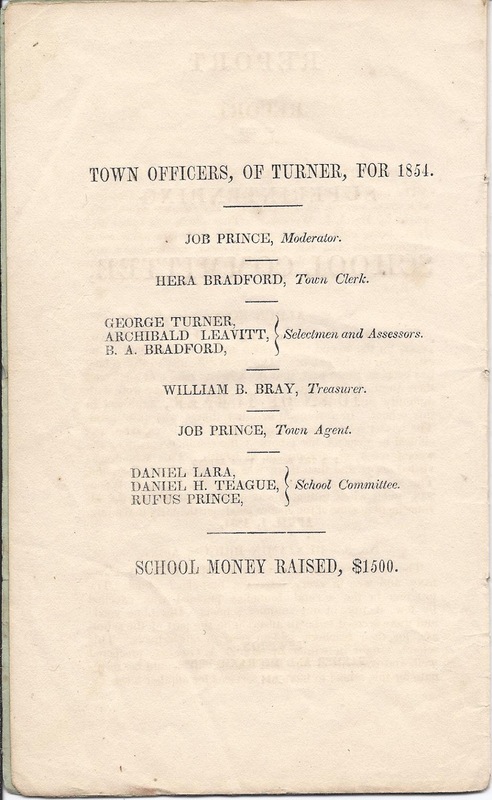 She spent at least part of her life in Massachusetts teaching school. Her death occurred in 1977 at Albion, Maine. If you have corrections/clarifications to the information above, please leave a comment or contact me directly. Real photo postcard of married couple Otto and Sally Aalto of Monson, Maine. Otto and Sally were presumably two of the many Finns who moved to the Monson area because of job opportunities in the slate quarries. Otto Aalto was born in Finland on 18 June 1892, the son of Sakarens and Ida (Hakenen) Aalto. I probably butchered Otto's father's first name, but his name on Otto's marriage record is hard to decipher. If Otto's parents came to Maine also, it would have been after 1915, as their residence on the marriage record was Finland. Sally (Partinen) Aalto was born in Finland about 1900, daughter of William and Amanda (Alrickson) Partinen, who all emigrated to Monson. Otto and Sally were married at Monson, Maine, on 27 December 1915. Three children were listed with them in the 1930 Census of Monson. Otto worked at the slate quarries in the area. If you have corrections to the above information or if you feel that the Otto and Sally Aalto or Salto pictured on the postcard are another couple entirely, please leave a comment or contact me directly. Group photograph of young men , taken at the University of Maine, East Oak, January, 1951. 8" x 10". The reverse of the photograph above contains the identities and placement of the men. The bottom half contained their complete addresses at the time, but I cropped that out. I indicated their state of residence at the time, in their identifications, below. I don't know whether they were graduating seniors, team members, returning alumni or other group. Cabinet photograph of a man identified on reverse as what I believe is C. F. Dudley, though I'm not positive about the middle initial. I found a Charles Franklin Dudley living at Limerick, Maine and wonder if he might be the man in the photograph. 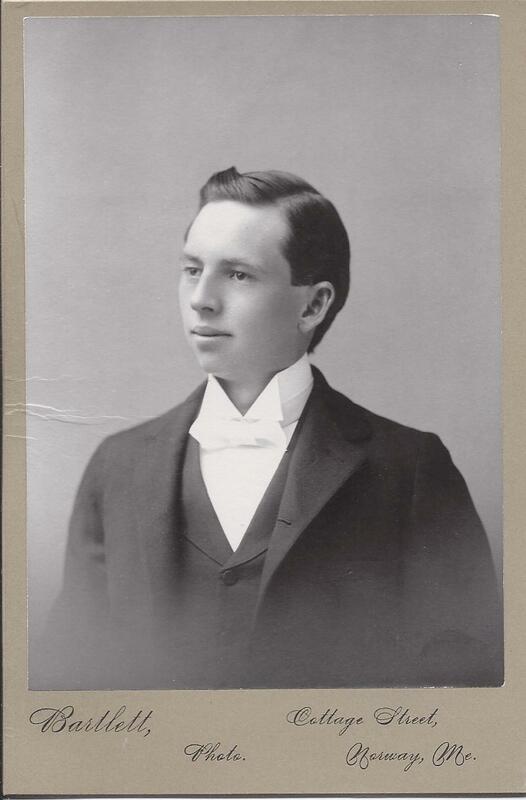 Charles Franklin Dudley was born 14 August 1874 at Milton Mills, New Hampshire, son of James Daniel Franklin Dudley and his first wife, Annie (Jenness) Dudley. His paternal grandparents were Charles and Phoebe (Coleman) Dudley. His maternal grandparents were Alfred and Bertha (Dexter) Jenness. On 1 July 1894 at North Parsonfield, Maine, Charles married Jessie M. Richards, daughter of Lewis and Mary (Durgin) Richards. They made their home at Limerick, Maine; I found two children for them, a son and a daughter. Charles worked as a tinsmith and plumber. I found the record of a marriage between a Charles F. Dudley and Florence E. Edgerley in 1918. On Charles' death record from Chepachet, Rhode Island, he was shown as widowed, with his deceased wife's name as Jessie Richards. Perhaps he and Florence divorced? Perhaps he and Jessie divorced and got back together again later in life after Florence died? Perhaps it was a different Charles F. Dudley who married Florence? If you have any corrections to the information above, please leave a comment or contact me directly. Photograph of Amelia Springer (Merchant) Wasgatt of Corea, Maine. She was born 7 September 1904 at Winter Harbor, Maine, daughter of Alfred M. and Emma Isabell (Springer) Merchant, born in Sullivan, Maine, and Hancock, Maine, respectively. Her paternal grandparents were Solomon and Lydia Sarah (Thorne) Merchant. Her maternal grandparents were Lewis and Isabel Collins (Dinsmore) Springer. On 26 November 1924, Amelia married Malcolm Wasgatt, son of Frank Raymond Wasgatt and Millie A. (Young) Wasgatt, born in Eden, Maine (on Mount Desert Island) and Gouldsboro, Maine, respectively. His paternal grandparents were Ambrose H. and Della (McFarland) Wasgatt. His maternal grandparents were John Patrick Young and Sophia Hammond (McCaleb) Young. 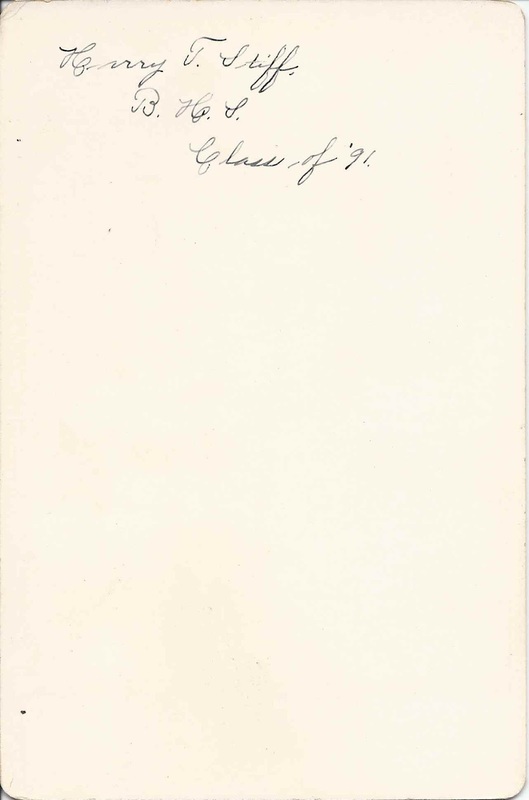 Note of December 1, 2015: As you can see in the comments section, a reader feels that the young lady is Hazel Gladys Keyes, who married Herbert Ellison Gray. c1910 photograph of a woman identified on reverse as Hazel Keyes. The photograph was taken by a studio in Belfast, Maine. 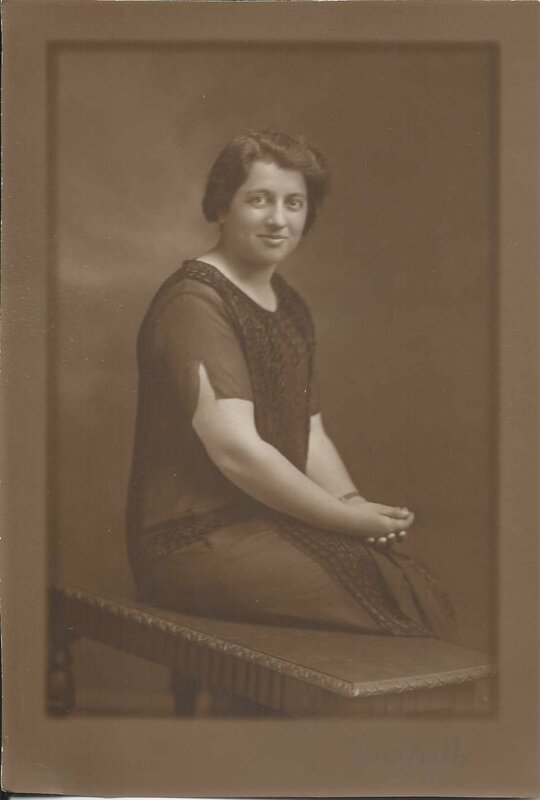 She was likely Hazel Gladys Keyes, who was born about January 1893 at Old Town, Maine, daughter of Elmer and Isabella (Neil) Keyes and sister of Margaret Esther Keyes, whose photograph is the subject of another post. 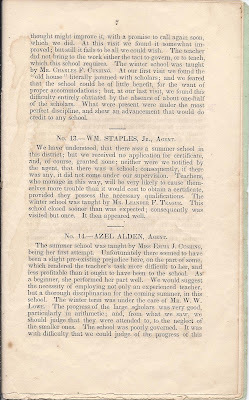 I wonder if Hazel had been attending Eastern State Normal School at Castine, Maine, at the time of the photograph. 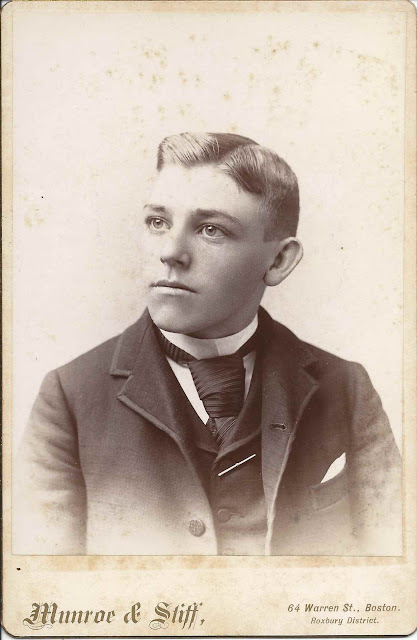 I have other photographs of students there taken by a Belfast, Maine photographer, who presumably traveled to Castine for the sittings, most likely by boat, which was a logical way of traveling the indented coast of Maine in those days. On 11 January 1913, Hazel married Herbert Ellison Gray, son of Herbert Oliver Gray and his first wife Sarah Emeline (Robbins) Gray. Sadly, Hazel died not long after her marriage, on 2 January 1919. If you have further information or if you feel that the Hazel Keyes in the photograph is not Hazel Gladys Keyes, please leave a comment or contact me directly. Photograph of two young girls, partially identified on reverse as V. R. H. and Vivian Booth from Springfield. Sadly, no photographer's imprint to give a clue as to which state or province Springfield was located in. V. R. H. and Vivian Booth [hope I have her first name right] from Springfield. My hat was very beautiful cream straw with different colored straw flowers. Green crepe dress with [a bunny ?] on pocket. If you have an idea of who these two girls may have been, please leave a comment or contact me directly. Vintage photograph of two adorable children, identified on reverse as Jamsie Atkin and his sister. Sadly, no photographer's imprint to give a clue to the locale. The identification was apparently done by a child so I'm not sure if Jamsie or Jamesie was his nickname. Jamsie may have been James Atkin, James Atkins, James Aitken or another name entirely. The numeral 127 was carved or painted on one of the risers of the steps the children were sitting on, in case that might jog someone's memory. I don't know whether the children lived there or were visiting relatives or neighbors. If you have any theories as to the identities of Jamsie Atkin and his sister, please leave a comment. 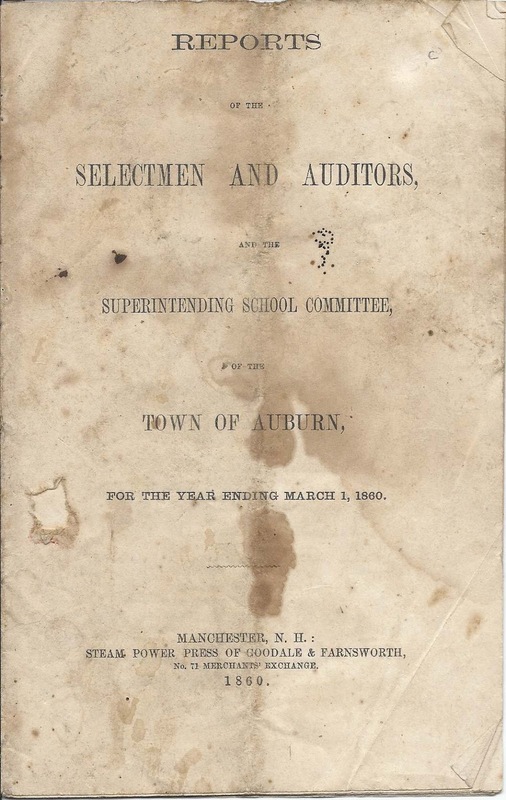 Reports of the Selectmen and Auditors, and the Superintending School Committee, for the Town of Auburn, for the Year Ending March 1, 1860. 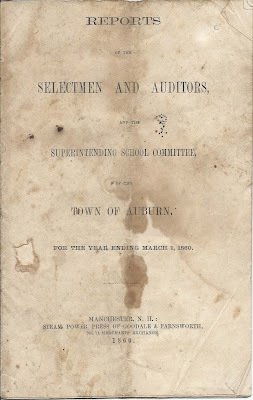 Printed in Manchester, New Hampshire, by the Steam Power Press of Goodale & Farnsworth, 1860. Names are transcribed after the pages; note: some names appear multiple times on the same page but may be transcribed only once. 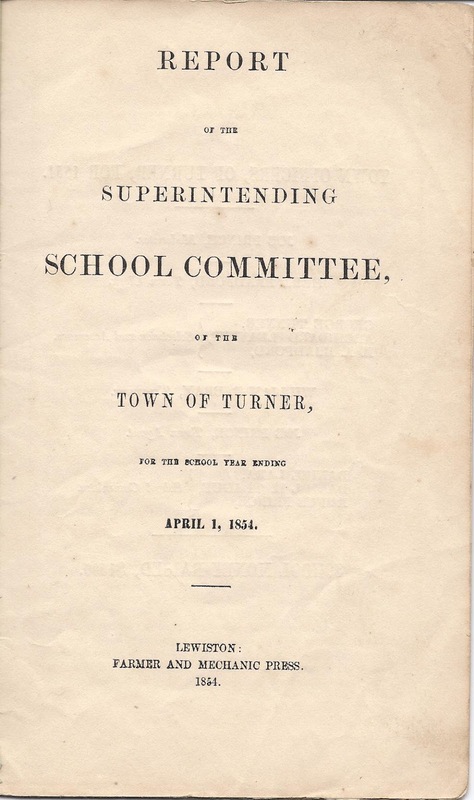 The report of the School Committee is an interesting read.